To meet world population demands for food it has been estimated that the production of rice, the world’s most important staple food, must increase by 24% by 2050. As well as the challenges involved in growing more rice on less land and water, farmers need new rice varieties adapted to changing climatic conditions. The main objective of the International Rice Research Institute (IRRI) in the Philippines is to help farmers improve their yields and thus sustain their livelihoods – a mission that calls for joint efforts across the globe and for high-performance data communications networks, such as TEIN, to facilitate data-intensive collaborative crop research. One of the consequences of climate change for many millions of rice farmers today is an increased risk of flooding. Although rice needs water to grow, most varieties can’t survive being submerged for long. 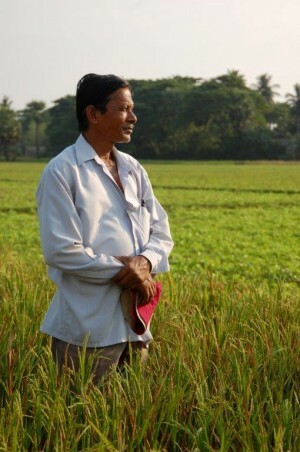 Basant Kumar Rao is an Indian rice grower whose farm has been recently inundated. In earlier years this would have been a complete disaster, with his entire crop lost. This time, while little of his regular harvest could be salvaged, his crop of a new submergence-tolerant rice variety survived. Teaming up to develop climate-proof rice varieties IRRI scientists and collaborators have found a gene named Sub1 that allows rice to survive complete submergence for up to 17 days. The donor rice line with the Sub1 gene is a traditional variety which is low yielding, but if the same gene can be added to popular varieties preferred by farmers, the results can be dramatic as shown in the image overleaf. A breeding technique, known as marker assisted selection, was used to transfer tolerance, including submergence tolerance, to various biotic and abiotic stresses in popular rice varieties. To conduct this work, materials and genomic datasets needed to be exchanged between scientists working in a number of different rice growing countries in Asia and Africa. Other data that needed to be shared by scientists working across the various geographical locations included high-resolution geographic information system data on growth, survival and agronomic characteristics of rice varieties and yield forecast. Although the gene bank at IRRI holds over 109,000 known varieties of rice, relatively few of these have been used by the world’s rice breeders. Advanced connectivity has an essential role to play in unlocking the potential of the gene bank. Understanding genetic diversity in rice at a molecular level is the key to improving important rice traits associated with higher yield, disease resistance, drought and flood tolerance, and human health benefits. IRRI’s scientists and collaborators at Cornell and Colorado State University in the US, as well as research organisations across the world are applying next-generation DNA-sequencing technology to the genomes of over 60 rice varieties. Before long, 2,500 rice varieties will be genotyped with 600,000 markers. IRRI is connected to the national PREGINET network in the Philippines and is linked thereby, via TEIN, to international collaborators on the pan-European GEANT network, as well as to colleagues in other parts of the world.